When I was a child, cream cheese was much like a food group for me. Every day, I would bring one or two of those creepy yet convenient packets of cream cheese with me and put it on just about any food item with glee. Luckily, for me, I grew out of that phase, but I definitely still have a soft spot for that creamy goodness of a spread. It’s exciting to see so many vegan cream cheese alternatives on the market. 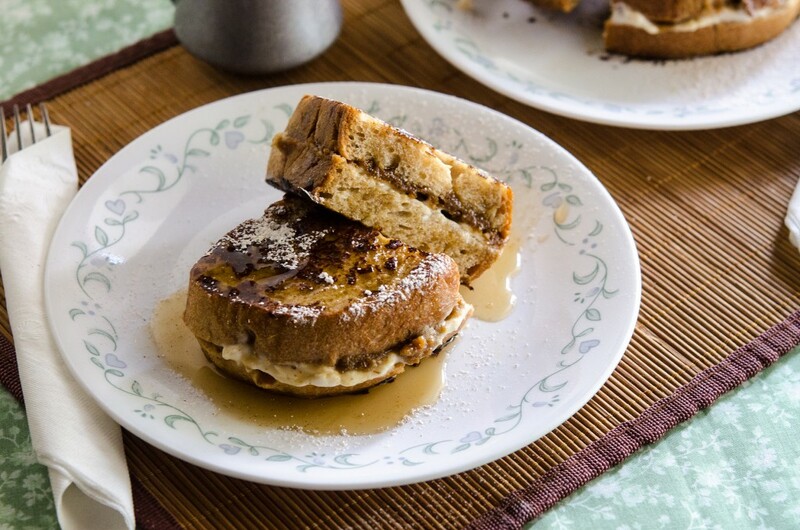 First, I tried the Original flavor with the recipe that I did for the Vegan Cuts Fall Harvest eBook: Fig-Stuffed French Toast (see recipe below). I really liked the smooth and thick texture of the cream cheese, and it was just savory enough to pair perfectly with the sweet fig spread. I was not disappointed! The other two flavors I tried out a couple of ways. “With a spoon” was clearly the first choice and on their own they were both enjoyable and tasty. I’ve had other onion-type flavors of vegan cream cheese where the onion/chive/what-have-you just isn’t very strong. If you’re going to promise me garlic, give it to me! GO Veggie! found a really good balance between base and flavor, with nice chunks of chive swirling around in there too. Strawberry was good as well. I’ve tried it with peanut butter pretzels, in a banana bite sandwich with peanut butter, and by itself (refer to spoon method mentioned above). All of the above were very delectable! 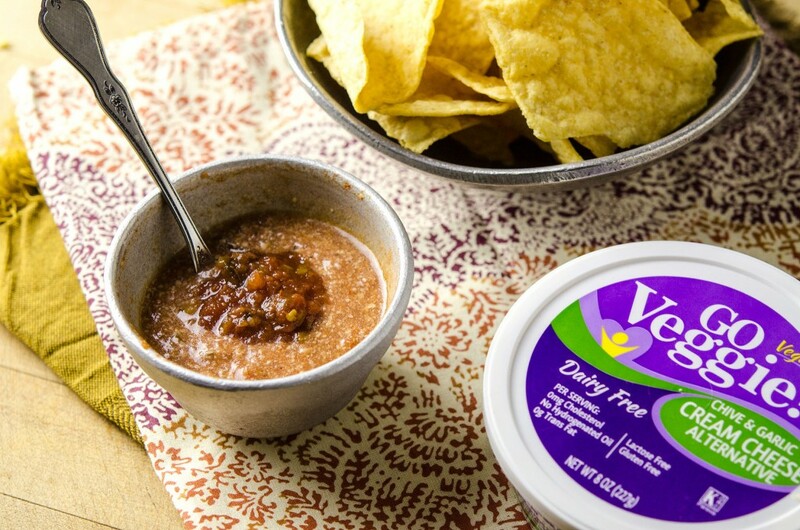 Also, try heating the Onion & Garlic flavor with salsa to make an addictive dip for tortilla chips. It would be great to serve at your next Sunday football party. Overall, I was very please with these cream cheese “alternatives” and would definitely buy them in the future. Now, if you’re inspired to create some fun and eye-catching dishes with these cream cheeses, visit GO Veggie! On Facebook, upload your recipe with photos, and enter to win 1 of 500 embroidered GO Veggie! aprons. GO Veggie! will also donate $10 to one of their charity partners of your choosing. Sweet, homemade fig spread with vegan cream cheese stuffed between bread slices makes for a marvelous brunch recipe. Using a food processor, puree the banana, non-dairy milk, flaxseed, nutritional yeast and salt together until smooth. Pour into a shallow bowl and set Rinse out the food processor and place the figs and warm water into it. Process until it creates a thick paste, this may take a minute or two. Scrape the walls of the processor so that there are no chunks. Taking your bread, spread the fig mixture over 4 slices of bread. Spread 1 T. of Go Veggie Cream Cheese evenly over each of the remaining 4 slices. Sandwich each fig & cream cheese together and press firmly (don’t squish them). Warm a non-stick skillet or griddle over medium heat with a very thin coating of coconut oil. 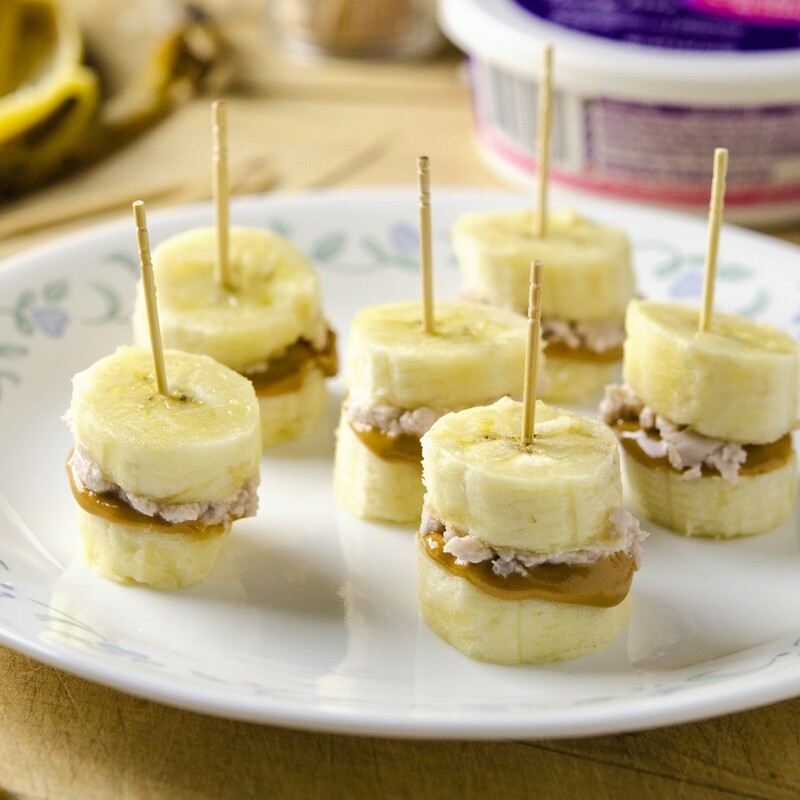 Once hot, dunk each side of the “sandwich” into the banana mixture and let the excess drip off. Place it on the skillet and cook until it stops sizzling (usually 3-4 minutes), then use a thin spatula to flip, making sure to get completely under the bread and coating so that it does not tear off. 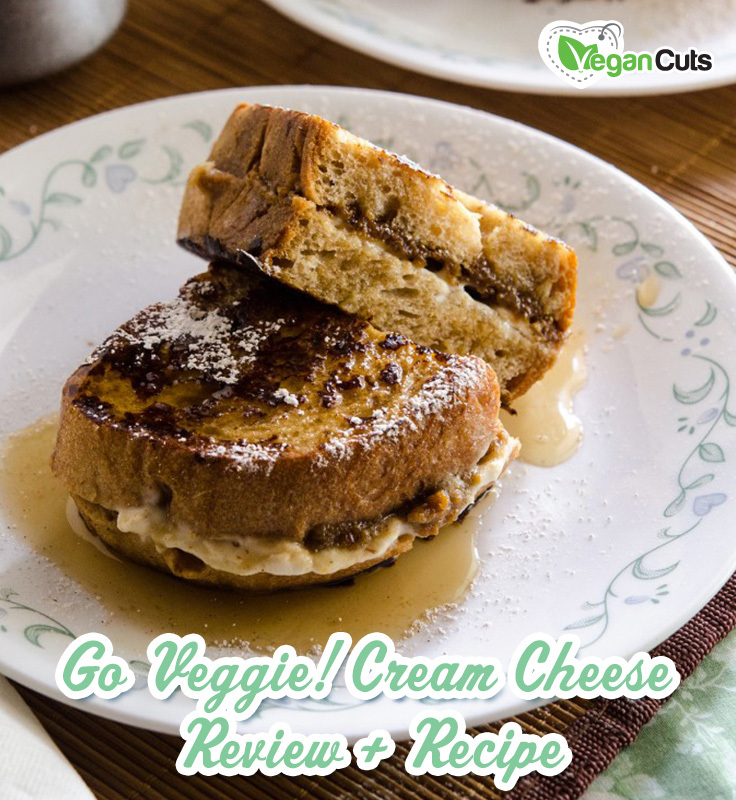 After you test drive this recipe, create your own original recipe using Go Veggie! Cream Cheese and enter the #SpreadCheer contest on their Facebook page! THhis is cool and very delicious. Go veggie! I just tried the plain version as there was no other in stock. Oh my, it was the WORST THING I EVER PUT IN MY MOUTH. Salty chemical taste. I hate to waste money and I really wasted it on this. I just threw it in the trash. I’m so sorry to hear you didn’t like what you bought! Everyone has different taste. You know, I find that many grocery stores will do refunds or exchanges on products that you don’t like, if you take them back very soon after your purchase date. You might check with your local store to see if they have a similar policy! I purchased some Go Veggie original this weekend. I will admit, I was scared when I spread it on my bagel, other vegan cheeses I have tried were not good. Amazingly this tastes very similar to real cream cheese! I’m not wild about the pasty looking texture, so I probably wouldn’t eat it by itself, but it was great on my bagel. Try it if your vegan, or trying to get there like I am.